Ever been on a long layover? Have you ever been on a long layover? As travelers, long layovers are rarely ever fun. You have to find entertainment, and when that’s all gone, you have to find a place to sleep. On the floor, on a tiny bench, on Ray’s lap…we’ve all been creative. And you wake up and can’t move your head without whining about the pain. It’s an adventure, but one we can live without. Worry no more! 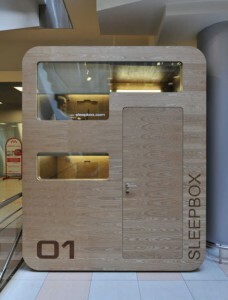 A Russian firm, Arch Group, introduced a mini-hotel called the Sleepbox. It’s a box that comes standard with beds, bedside tables, electrical outlets, and reading lamps. But wait! It gets better! They can also include WiFi, televisions, and an alarm clock. It’s everything you need while traveling! It’s small, but it’s all you need to get a couple of hours of comfortable snooze time. This box can be available at airports, railroad stations, hostels, and offices (this might be a popular spot if it ever comes to my work). I would love to see one of these one day. I can think of a couple of places where this might have been useful. Including the Charles de Gaulle airport where Ray almost got mugged if he wasn’t so badass. But that’s another story. 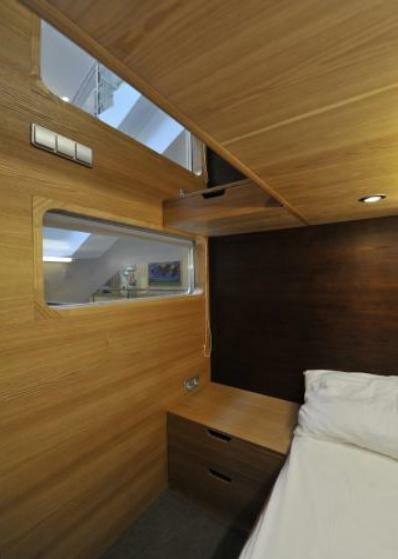 Have you ever slept in one of these? Pros? Cons? Would you ever take advantage of this? Or is it excess luxury?